AirPura T600 is an effective AirPura solution to cigarette and tobacco smoke. 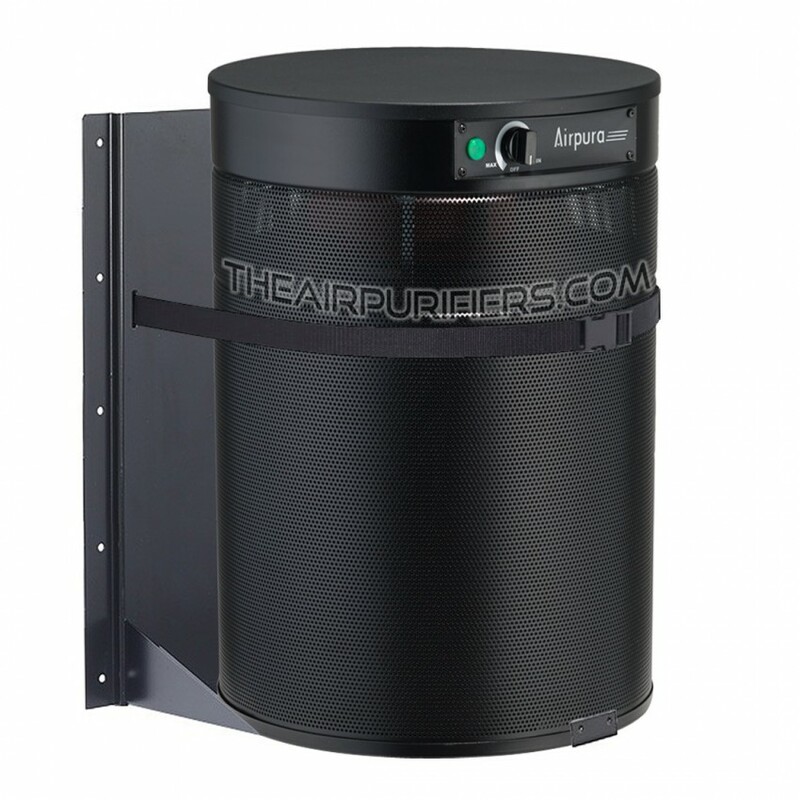 AirPura T600 employs a massive amount of adsorbent in the AirPura oversize canister and the AirPura T600 special Tar-barrier pre-filter. This allows AirPura T600 to deliver an exceptional rate of cigarette and tobacco smoke removal and provide a superior level of protection from primary and secondhand smoke. 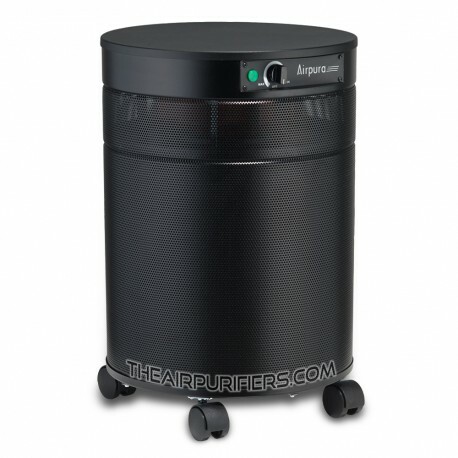 AirPura T600 employs the oversize 3-inch deep carbon canister with massive amount (26 lbs.) of adsorbent. 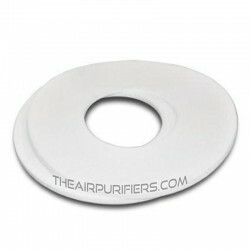 The AirPura T600 tar-barrier pre-filter provides an effective removal of tars in cigarette smoke. AirPura T600 is powered by high efficiency, low energy consumption and quiet motor/fan assembly. The AirPura T600 variable speed control allows to set the optimal air flow in most situations. AirPura T600 delivers an impressive air flow of 560 CFM which makes T600 effective in purifying areas up to 2000 sq. 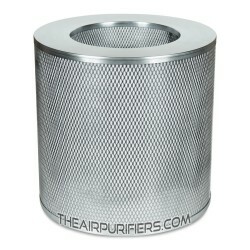 ft.
AirPura T600 features non off-gassing and durable the all metal housing with 360 degree polluted air intake. AirPura T600 is covered by the 5 / 10 Year limited manufacturer's warranty - strongest in the industry. 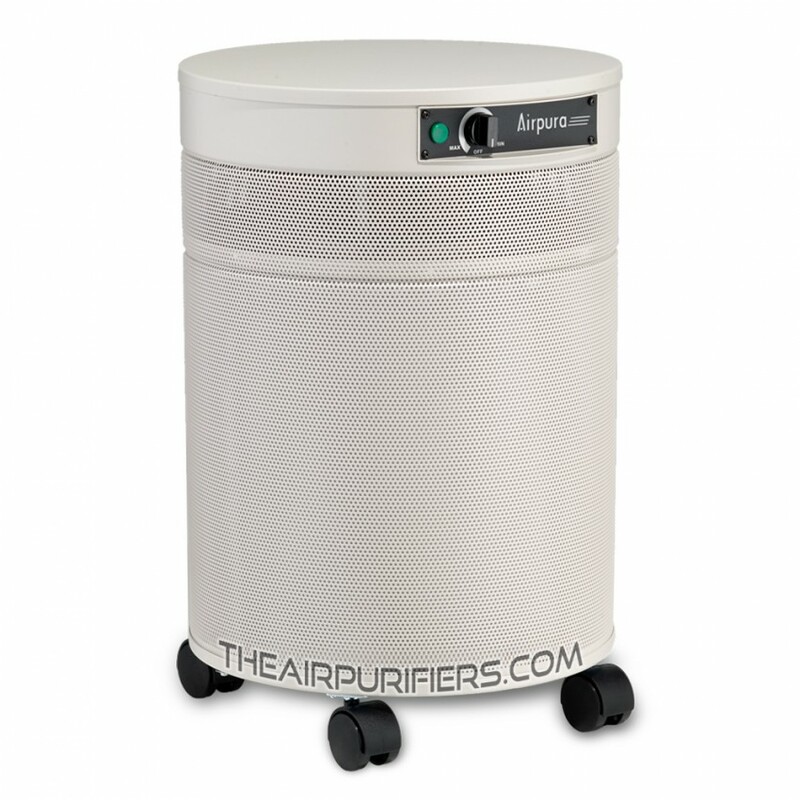 AirPura T600 doesn't produce any ozone or any toxic off-gassing. AirPura T600 ships Free by Ground service in US and Canada. AirPura T600 comes with a 30-Day Money Back Satisfaction Guarantee policy. AirPura T600 - When to Use? AirPura T600 air purifier's single the most important purpose is to deliver a Superior rate of removal of all dangerous components in a cigarette (tobacco) smoke and provide a superior level of protection from primary and a secondhand smoke. Aside from the households with heavy smokers the AirPura T600 typical applications include: homes with a smoker, bars, restaurants, smoking rooms, pubs, clubs and all other locations where the Extra efficient removal of cigarette smoke is a top priority. AirPura T600 comes from the factory with All Filters preinstalled (per model specification) and Ready-to-use. The core of the AirPura T600 air filtration system is the oversize activated carbon filter canister - similar to the one used in the model C600. It contains a massive amount (26 lbs.) of granulated carbon adsorbent in 3-inch deep canister. Such a huge amount of adsorbent combined with an extended dwelling time in 3-inch deep carbon bed renders the unparalleled adsorption capacity and efficiency in removal from the air of toxic chemical substances in cigarette / tobacco smoke such as: Acetone, Ammonia, Benzene, Cresol, Formaldehyde, Hydrogen cyanide, Nicotine, Phenol, Toluene and nearly 400 other harmful toxic chemicals. The HEPA-Barrier post filter is used in lieu of True HEPA filter to provide an adequate removal of microscopic particles and fine ash in cigarette smoke. AirPura T600 employs the special Tar-Barrier Pre filter instead of a standard Polyester based one. The Tar-barrier pre filter has a property to trap and hold tar in cigarette / tobacco smoke, thus protecting the air filtration system from faster contamination by sticky cigarette smoke tars. 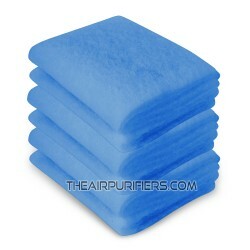 The AirPura T600 filter compartment is pressure sealed using the non off-gassing felt gaskets. The top and bottom felt gaskets help eliminate the polluted air by-pass and improve the overall air filtration efficiency. AirPura T600 is powered by the same high quality yet energy efficient Motor/Fan assembly with variable speed control rated at 560 CFM. The one piece Motor/Fan assembly is factory balanced to ensure the vibration and noise-free operation. The variable speed control allows the AirPura T600 users to select the speed setting that is the most suitable for any particular air cleaning application, activity or a time of the day. The motor and the electric components are placed in a separate chamber to eliminate the contact with the already filtered air passed the filters and prevent its re-contamination. The AirPura T600 unit can be equipped with an optional motor and power cord for use with 220-240 Volts, 50 Hz per customer's specification at Extra cost. AirPura T600 features the unified all metal housing - durable and impact resistant. The AirPura T600 air purifier 360° Polluted air intake (lower deck of the unit) improves the overall performance. The 320° Clean air outlet at the top deck of the T600 ensures an even clean air distribution. The clean air outlet in the upper deck of the unit is away from dust and dirt on the floor. AirPura T600 air purifier comes with the most comprehensive limited manufacturer's warranty. It gives the AirPura T600 air purifier owners a peace of mind. - 5-Year Full Warranty on Parts and Labor. - 10-Year Warranty on Labor (the most expensive part of the total repair cost if needed). The Total duration of Limited Manufacturer's limited warranty - 10 Years. 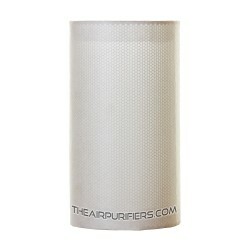 AirPura T600 is a stand along portable air purifier. As such, the AirPura T600 doesn't require a special installation - just unpack and plug it into electrical wall outlet. AirPura T600 can also be mounted on the wall using the available optional metal wall mount (brackets). Level of Noise, dB 28.1 - 62.3 @ 6 ft. Amount of HEPA Filter Media, sq. ft. 275 sq. in.